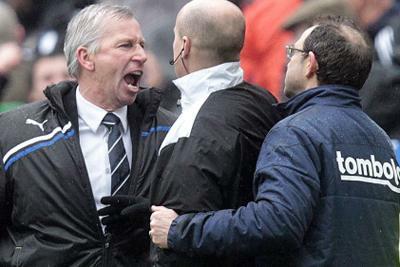 Do You Wish Alan Pardew Was Saying This? When I read the following, I thought that it exactly matched my thoughts on our current squad/team/situation. “We have to be seriously looking to strengthen our side. You only have to look at the back of the programme to see we don’t have any numerical strength, never mind anything else. We have got a few injuries to people but you are going to get injuries and suspensions during the course of the season and it is up to us to cope with them. That is inevitable but we just don’t have that strength in depth”. What an honest evaluation by…Martin O’Neill! Yes this was our friend from down the road talking about the mackems’ predicament but I honestly think that these words precisely define Newcastle United’s problems. I’ve got no time for O’Neill (and that dates way before he arrived at Sunderland) but when you compare these words to what Alan Pardew has been saying recently, our suave cockney charmer doesn’t come out of it looking too good. I think Pardew is very capable but when he says we have the worst injury situation of any Premier League club in years, which in reality is 2 or 3 first teamers at the most out at any one time, or that he couldn’t have had better backing form Mike Ashley…. I think the big difference between Sunderland and Newcastle is that the mackems have plenty of players but few of them are better than average/dross, while on Tyneside we had/have a core of excellent/very decent players and just need/needed two or three extra players. It is time for Alan Pardew to tell Mike Ashley straight, if we don’t strengthen in January then Newcastle are going to have big problems, ignoring reality won’t help anybody. The new Christmas issue of The Mag available now in all Tyneside newsagents and outside St.James’ Park before the Manchester City match, or buy a single copy and subscriptions in our online shop, or get a Gift Subscription with free personalised letter for the person you love (or ask for one for yourself! ).